My mom was 43 years old the day that she listened to the voice. Five years older than I am as I type this. She listened and so she lived. To see graduations, birthdays, weddings, births. To adopt new identities: Mother-in-Law, Great-Aunt, and yes, even Grandmother. When my mother paused in the kitchen that day to listen, perhaps with her hand resting on the counter near the neat pile of bills and school flyers, her tea nearby cooling, she heard a voice tell her to check her left breast. Immediately. She did. Her world fell apart. A lump. Cancer. The mother of all cancers, stage 4. She powered through. Surgeries. An experimental stem-cell transplant. It was living hell. And yet she seemed to always find the humor in the midst of the horror. When cancer came back in the form of a brain tumor, she later would quip that “brain surgery was a breeze!” (and she meant it). One day when getting cash from the ATM, her wig flew off and danced across the parking lot. She calmly walked over, retrieved it and placed it back on her head, not missing a beat. “I could laugh or cry, but I would rather laugh,” she said. My mother learned in the hardest way possible the importance of intimately knowing the map of your own body. She’d been diligent about annual mammograms. The year she found the lump, her most recent mammogram screening showed no irregularities. Of course, this was before the use of ultrasound and MRI screenings for high-risk patients, before testing for genetic mutations. She would later confess that she avoided doing monthly self-exams. I was afraid of finding something, she told me. She understood the absurdity of this, but fear holds a strong grip. When she was twelve years old she saw her mother die of breast cancer. Her fear was a real one. Today I share my mom’s story because she cannot. She passed away in 2013. Her story is this: my mother faced her largest fear—of finding cancer with her own hands. She chose to listen to quiet, loving voice that ultimately saved her life. While the costs were often great (so many sacrifices were made, of body and mind and spirit) she was able to celebrate nearly two more decades of birthdays. Of wedding anniversaries. 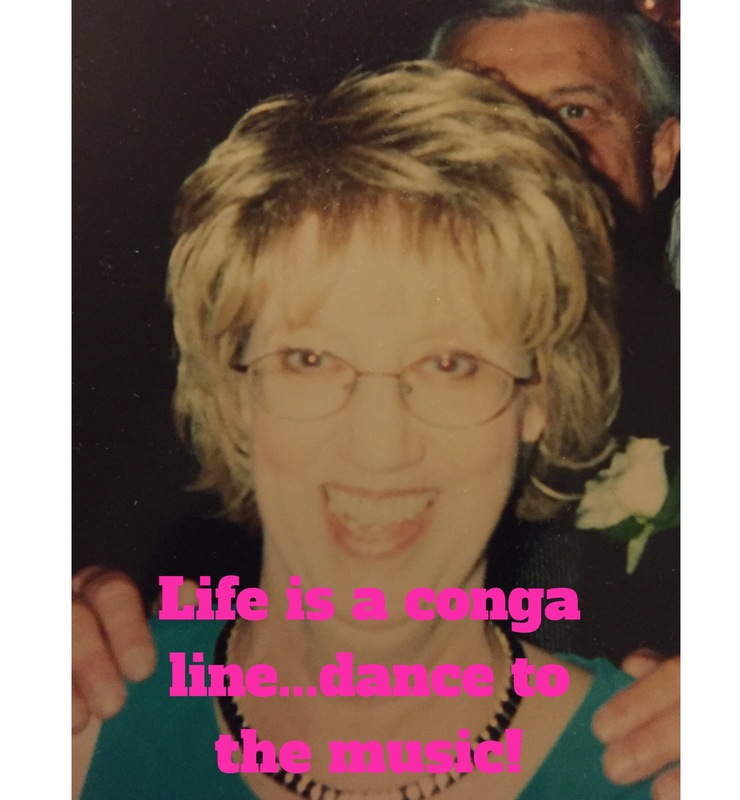 My mom was famous for starting conga lines at parties. Her life was a lesson in choosing to dance no matter the music that is playing—celebratory or sad, bleak or hopeful. She taught me that even when there are detours to dark and scary places, if you follow your heart, it will not lead you astray. It might even extend the dance. Let’s connect! I’d love to hear from you on Facebook, Twitter or Instagram. Just Follow the Joy! • This entry was posted in loss, Mothers & Motherless Daughters and tagged breast cancer, cancer, god, hope, life, loss, mothers, spirituality, writing. Bookmark the permalink. Sarah, This is so beautiful. I remember the day that your mom called to tell me of her diagnosis. She was so concerned about you and Carrie. She fought as hard as any person could to be there for you. It was very difficult, but she was there for many milestones. She must be so proud of you both. Oh, thank you Sarah. I am so glad I could capture who she was even if just a little. She really was full of so much joy and light. Thanks for the kind words.